Hey guys! Ready for another Broadcasted! review that will rock your movie world? 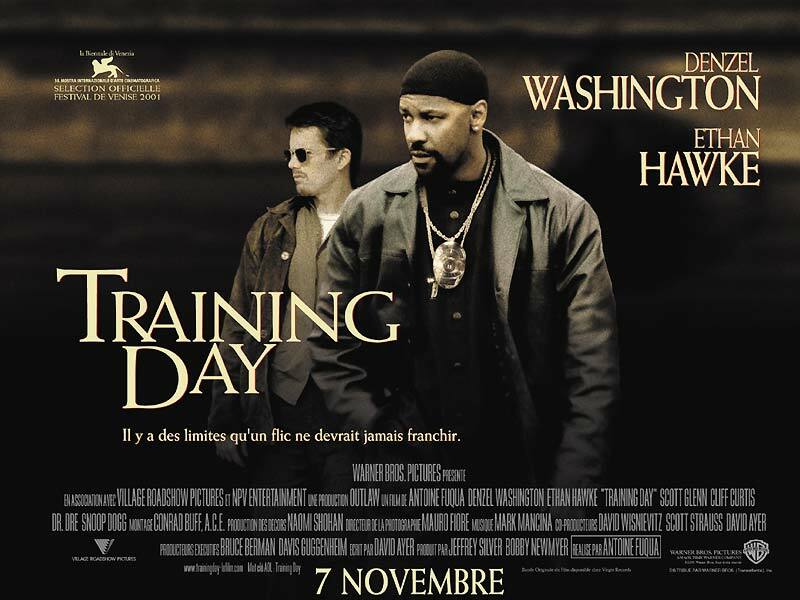 So, today we have Training Day directed by Antoine Fuqua (Shooter, King Arthur). I chose this movie after John Tucker Must Die because after watching an anverage teen movie, I wanted to get back to a more serious-minded and oscar-winning (Denzel Washington for Best Leading Actor) movie. I know this is probably a classic for most of you people but still it REALLY deserves a review. Training Day has truly good cast, besides an amazing performance by Denzel Washington with his super cool: “You wanna go home or you wanna go to Jail?”. He really did deserve the Oscar for this role. Ethan Hawke is pretty good in it too and, for the Hip-Hop fans, there surely is an all-star cast with superstar rappers Dr. Dre and Snoop Dogg and singer Macy Gray. Moreover, even if you begin to know what is going to happen pretty early in the movie, the whole scenario is pretty well written. Antoine Fuqua also managed to give the viewer beautiful images of L.A. and the filming is great, you can feel the tension between the characters and every emotion is visible (thanks to great acting too). Well, the movie is well packed up and if you’re looking for a good cop/action movie, I recommend you watch it, you won’t get tired of it. Why did I watch this movie? Mainly because Denzel Washington got an Oscar out of it so I wanted to see if he deserved it. You won’t be disappointed if you watch this movie even if you’re not a true Ethan Hawke fan (which I’m not), for those who hate Denzel Washington, I’m sorry but you won’t like it because the movie is mostly about him and this is the only thing I found annoying: the side characters are not really important to the movie. Ok, let’s wrap it up and this “broadcasted!” movie gets a more than decent 8.9/10. Trailer and a super cool scene of the movie after the jump. Thanks for reading guys! I’ll get back to you for more Broadcasted! reviews. Up next, How I met Your Mother Season 1&2&3. This entry was posted in American Films, Broadcasted! Reviews, Cop Movies, Movie Trailers, Videos and tagged Antoine Fuqua, Denzel Washington, Dr Dre, Ethan Hawke, Macy Gray, Snoop Dogg, Training Day by thebroadcaster. Bookmark the permalink.